A few months back I read Megan Abbott’s YA novel Dare Me and despite the novel’s caustic depiction of teenage girls, I really loved that book. 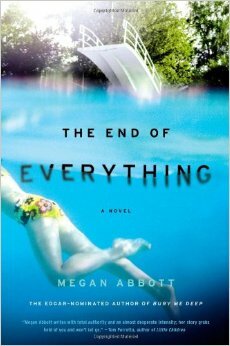 The End of Everything also tackles the secret lives of girls and, once again, Abbott’s writing is compelling. It was long ago, centuries. A quivery mirage of a thirteen-year-old’s summer, like a million other girl summers, were it not for Evie, were it not for Evie’s thumping heart and all those twisting things untwisting. It doesn’t take long for Lizzie to remember a car that she’d seen driving past them on the day Evie disappeared. The suspect is identified and Lizzie makes it her mission to figure out where Evie is. All this makes for page-turning suspense, but that’s not what The End of Everything is really about. Abbott’s books are like that – but you have to be fearless to read them. This entry was posted in Book Chat and tagged 2015, Book Review, highly recommended, mature teen by Christie. Bookmark the permalink.